Easter Sunday. © Max Straeten. 2015. Easter Sunday is the day when the Church celebrates the resurrection of Jesus Christ after three days in the tomb. It is also often just referred as “Easter.” It also marks in many people’s minds the true beginning of the spring season. It is a great feast day, both religiously in the Church calendar, and literally, in people’s homes, particularly as it marks the end of Lent — 40 days of restrained eating. 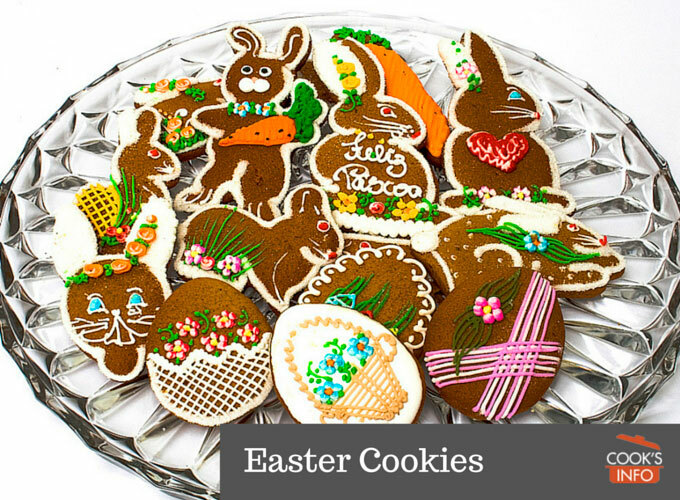 There are many traditional, ritual foods served at Easter. One of them is lamb, which is unfortunate, because lamb isn’t really all that available at Easter time, particularly when Easter comes extra early. While it’s true that most lambs are born in the spring, like many other animals, they actually need a few months to grow, meaning they don’t really come on the market till mid to late summer. That’s the time to buy lamb, not Easter, when all you can get is frozen lamb or some very expensive fresh lamb from the few lambs that happened to be born over the winter. The time of Easter, as a spring-time celebration, was originally a pagan feast to celebrate Eostre or Ostara, a Goddess of fertility. The timing of it was based on lunar calendars which are associated with the moon. In many ancient calendars, the moon was represented by a rabbit, because they believed believed they saw a rabbit on the moon, instead of a man. And thus rabbits were associated with the celebrations from the earliest days. In one legend, Eostre changed a bird into a rabbit — which explains the puzzling question of what a rabbit has to do with eggs in a nest. Though the Easter Bunny has survived the transition of the celebration from pagan to Christian to become a symbol of Easter, rabbit has surprisingly not become a food present on the Easter dinner table. 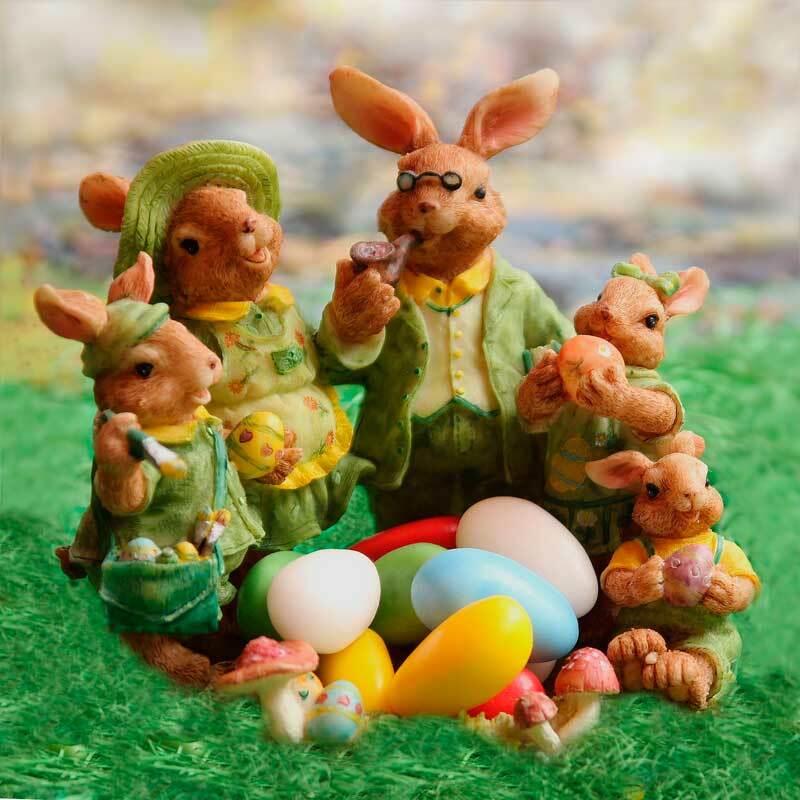 Though coloured eggs were associated with many spring festivals throughout history, it seems to have been only in the 1400s that their association with Easter as well began. 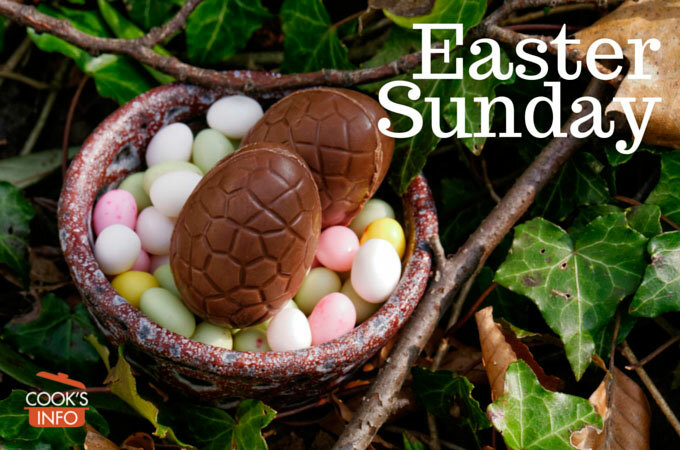 Easter can fall anytime between 22 March and 25 April. Though usually observed on the first Sunday after the first full moon after the first day of spring, it is not always. The scheduling of it is more complicated than that. It must be on a Sunday that is closest to 14 days after the 1st full moon that either follows the first day of spring, or falls on the same day as the first day of spring. Attempts to rationalize the date of Easter have been made — and resisted — for hundreds of years. There is a possibility, however, that the date could be fixed in the future. In 2016, the Anglican, Catholic and Coptic churches announced that they would begin discussions on setting a fixed annual date, “most likely for the second or third Sunday of April.” Bingham, John and Sophie Jamieson. Easter date to be fixed ‘within next five to 10 years’. London: Daily Telegraph. 16 January 2016. Presumably most people will take a “we’ll believe it when we see it” stance to the news. “Easter Sunday was another of our famous days. But we knew it by the hallowed name of ‘Peace Sunday.’ It was not that we were extra pious upon that day. We went, indeed, to the kirk and sang the Psalms, just as was our wont, but we never thought of Easter in its religious sense; we were ‘nane o’ yer papists and sic like trash, ye ken.’ But ‘Peace Sunday’ was a glorious day, nevertheless, and in this way. It was a time-honoured custom in Carglen for mothers to allow their children, masters, their men and maids — indeed, each was accustomed to allow himself or herself an illimitable number of fresh-laid eggs for breakfast. It was our annual festival of ‘peace’, and there was no time for quarrel, for there were so many eggs to be broken and eaten…. On a certain Peace Sunday I sat and watched Kit demolish thirteen eggs one after the other, and each shell was well cleaned. Five dozen or so were always cooked on ‘Peace Sunday’ in the farm kitchen at Linkerstown.” Gordon, Alexander. The Folks O’ Carglen: Or, Life in the North. London: T. Fisher Unwin. 1891. Page 278 – 279. “Wartime restrictions have been lifted regarding the manufacture of hollow chocolate figures, and the candy-makers of the Rosemarie de Paris kitchen have plunged into the Easter egg business in big fashion again. On display are huge chocolate eggs, covered with gleaming foil in silver and gold, draped with satin ribbon. The eggs open to reveal an assortment of the firm’s finest chocolates. When the candy is gone, the eggshell itself may be broken to munch bit by sweet bit.” Paddleford, Clementine (1898 – 1967). Food Flashes Column. Gourmet Magazine. April 1946. 1. ↑ Bingham, John and Sophie Jamieson. Easter date to be fixed ‘within next five to 10 years’. London: Daily Telegraph. 16 January 2016. 2. ↑ Gordon, Alexander. The Folks O’ Carglen: Or, Life in the North. London: T. Fisher Unwin. 1891. Page 278 – 279. 3. ↑ Paddleford, Clementine (1898 – 1967). Food Flashes Column. Gourmet Magazine. April 1946.